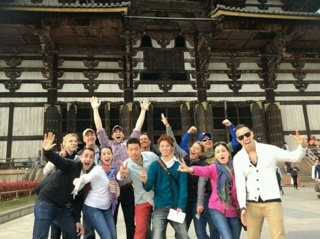 On April 19th we went to Nara and helped foreign people who are travelling and guided them. Nara park is big and there are many deer and ancient Japanese culture there. I thought of it with Japanese pride. I can't speak English very well but I enjoyed it because even if I could express myself in English but I could use gestures to communicate with them. For me it was a very precious experience. After this experience I feel that I want to learn more to be able to speak good English well enough to clearly express how I really feel. 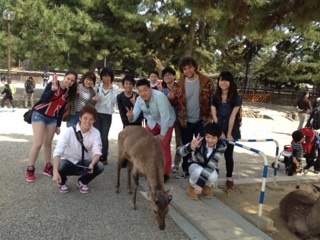 Last Saturday, I went to Nara with the ESS club. It was the second time that I have been there. The first time I went there was for sightseeing , when I was in junior high school. This time, I went as a guide. It was my first time to guide someone, so I was very nervous. I guided a woman that came from Switzerland and a group of Brazilians. They listened to me very carefully and all of them was kind to me! I thought that they would not listen to me, so I was very happy to have their attention! With that experience I realized how difficult it is to explain something to others clearly. I want to improve my English speaking skill and communicate more actively with foreigners! In my opinion, to be success in speaking you have to keep in mind the word "don't be shy"! I learned that after working as a guide. Because I think the most important thing is to express yourself even you don't know English like you do your native language. Last Saturday, we went to Nara by train. At first, we went to Ichy's favorite ramen shop, and the ramen was very delicious. After that, we went to Nara park where there are a lot of deer. And we saw a musician who is a member of TOKIO, Taichi Kokubun. We were surprised to see him. It was a good chance to talk with foreigners We had a good time in Nara. 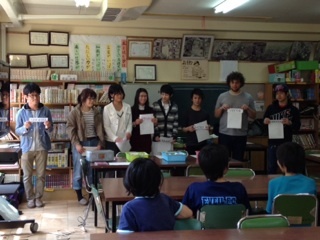 Last April 19th I went to Sugawara Higashi elementary school to teach English to the students of this school. I was worried about teaching the children because it was my first time to join this project. So, I looked at what the others were doing and followed them. At first the children didn't talk to me. But what I did was, I taught them slowly and then they tried to talk to me in English. When I was a child, I wasn't active like them. So I was very happy to see them very active. Joining this project made me realize again that English is fun. I thought that Japanese can be good at English by studying harder. 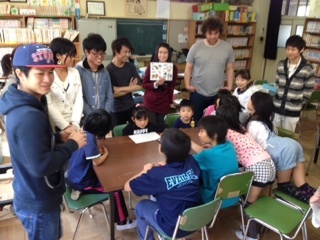 Last Saturday April 19th I went to the elementary school and played with the children using English. At first I was very nervous, but finally I relaxed. It was an exciting day.We taught animal names in English, taught songs and played a card game. I was surprised, because they know a lot more animal names than me. To tell you the truth, there are several animals that I don't know in English. I realized that I have to study more. It looked as if their eyes were shining when studying English. They looked very excited to study English, so I was also excited to teach them. To communicate with children is difficult because they are different to adults. Children are very honest. Not only this experience can make you notice the enjoyment of studying English but it can also improve your ability of communication. It was a nice experience for me, so I'm inviting everyone to join this project. It's your turn.